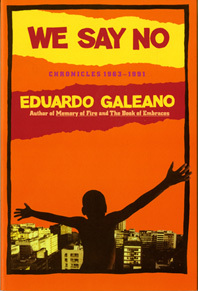 The title of We Say No is drawn from a speech delivered by Eduardo Galeano in support of democracy in Chile in 1988. It eloquently states the case that by saying no to a global system of greed, repression, and exploitation one says yes to the universal values of equality, freedom, and love. All of the thirty-four pieces that comprise this book affirm the elemental struggle of the forgotten and the dispossessed for simple human dignity. From vivid portraits of the "last emperor" Pu Yi, Pele, and Che Guevara to a defense of the political nature of the literary enterprise in Latin America to stinging critiques of the end-of-history thesis and the "celebrations" of Columbus's voyages of discovery (and conquest) to the genesis of Memory of Fire, the pieces in We Say No are united by Galeano's unique ability to blend stirring political commitment, a magical literary facility and a large historical imagination into a seamless web. The result is a volume indispensable to the growing legion of Galeano's American readers and to all concerned with the issues of peace and justice in the Americas and, indeed, in the entire post-Cold War world.